In an earlier blog-post, I explored the institution of the "Grand Tour," an extended trip through Europe to engage with the classical heritage of Italy, considered as an essential element of the education of an aristocratic young man through most of the 18th Century. Each grand tourist chose his own itinerary, in consultation with his father, friends and tutors: a few lingered in the Alps; many stopped to draw and paint the scenery; some continued south from Rome, to Naples and Sicily. Often, they were away for more than a year, and costs inevitably mounted. There were a great many families who considered themselves "gentle-folk," but could not afford a Grand Tour in continental Europe. An idea arose, among these people of the "middling sort" (country parsons; men who had served as officers in the army or navy, who owned land, but not vast estates; men who ran businesses, but had not yet risen into the ranks of the industrial plutocracy), that similarly edifying and educational experiences might be obtained closer to home. William Gilpin (1724-1804) was born in Cumberland, the son of an army captain. His brother became a professional painter, but William opted for a career in the Church, graduating from Oxford in 1748, and later becoming Headmaster of Cheam School. 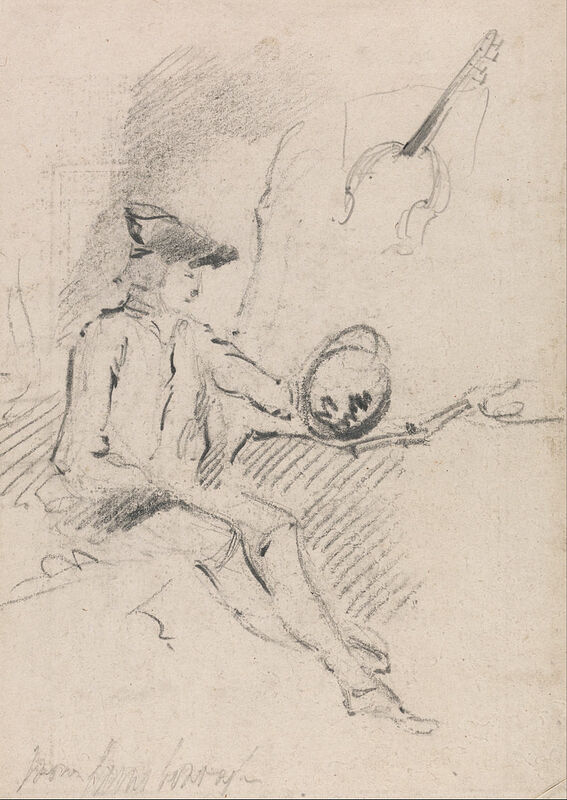 Certainly he could not afford a Grand Tour, and nor could he amass a significant art collection, but he nonetheless aspired to the connoisseurship that, in large part, defined a "gentleman." 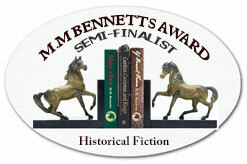 Owners of great country houses frequently allowed access to their art collections for well-connected people of lesser means (in Pride and Prejudice, Elizabeth Bennett visits Pemberley prior to her engagement to Mr Darcy). Prints were also widely available. A man like Gilpin could see great art, even if he could not own it. In an essay on prints, published in 1768, he coined the idea of "picturesque" beauty - "a term expressive of that peculiar kind of beauty which is agreeable in a picture." 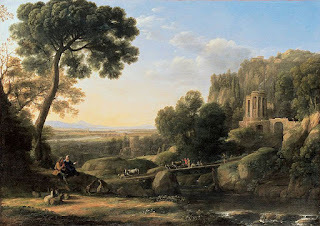 Gilpin did not have just any "picture" in mind, but more specifically the landscape paintings of the 17th Century French artist, Claude Lorrain. 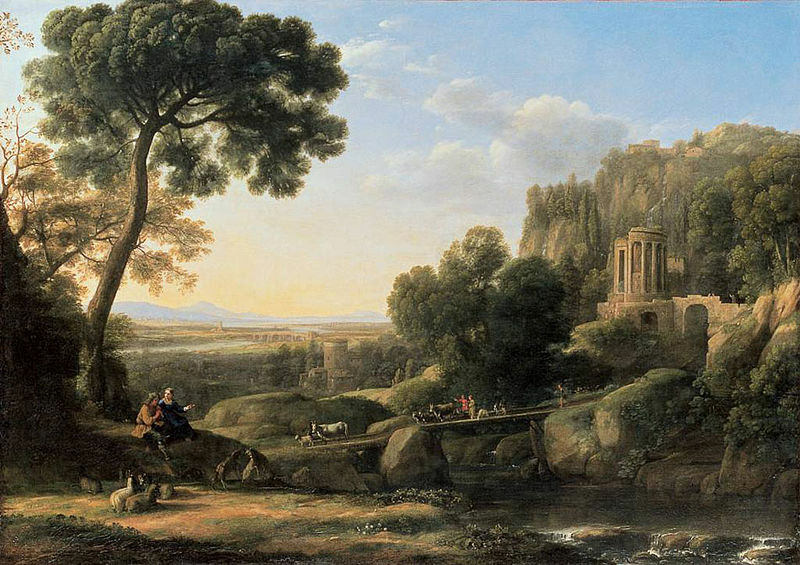 "Landscape with Shepherds," by Claude Lorrain (1644), Musee de Grenoble (image is in the Public Domain). 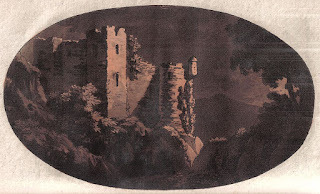 In 1782, Gilpin published one of the very first "picturesque itineraries," Observations on the River Wye, and several parts of South Wales etc., Relative Chiefly to Picturesque Beauty. It was among the first guide-books for domestic tourism, and it gained many imitators, "picturesque itineraries" for travel through the Lake District and Scotland, Devon and Cornwall. Entrepreneurial manufacturers even marketed the "Claude Glass," a special darkened, convex mirror which, according to Gilpin, "gives the object of nature a soft, mellow tinge, like the colouring of that master [Claude]." "Man holding a Claude Glass," by Thomas Gainsborough, Yale Centre for British Art (image is in the Public Domain). Improvements to Britain's road systems brought about through Turnpike Trusts, together with the effective suppression of highwaymen, made such journeys easier and safer, and young women often accompanied their brothers on these "picturesque" perambulations. Penrith Castle, from Gilpin's (1786) guide to Cumberland and Westmoreland. Photo: Roger Griffith (image is in the Public Domain). A "correctly picturesque" scene should, in Gilpin's influential view, be "rough," "intimate," "varied" or "broken," without obvious straight lines. Ruins were particular objects of interest (as they were for Grand Tourists), but they did not, for Gilpin, have to be classical ruins. He even went so far as to suggest that "a mallet, prudently used," might render Tintern Abbey more "picturesque" than it already was! 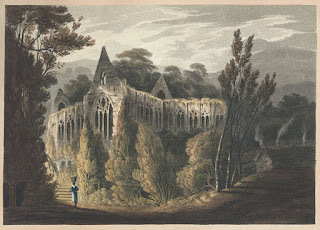 Tintern Abbey, North view, by Frederick Calvert (1815), National Library of Wales (image is in the Public Domain). 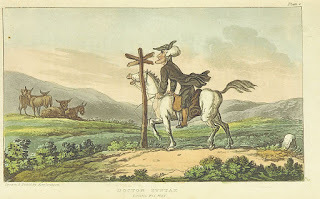 Such fads were bound to attract the attentions of satirists, and William Coombe published The Tour of Doctor Syntax in Search of the Picturesque, illustrated by Thomas Rowlandson, documenting the mishaps of a Quixotic clergyman following one of these itineraries. 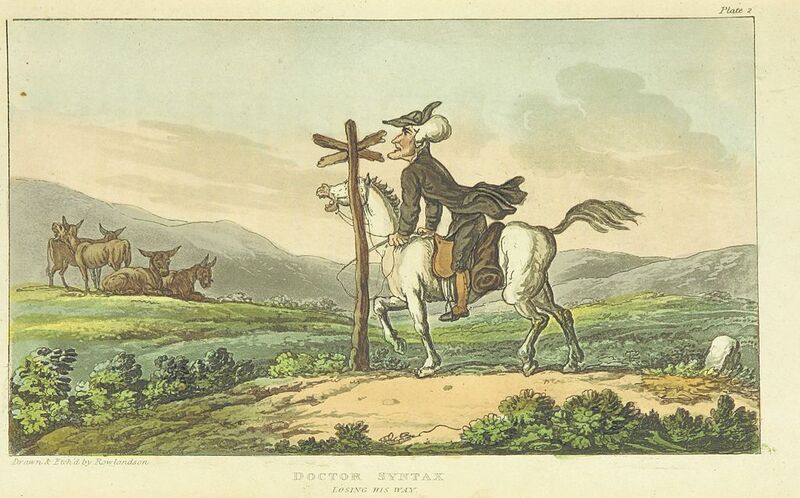 "Doctor Syntax getting lost," by Thomas Rowlandson, British Library (image is in the Public Domain). Which once its several pointers grac'd. There's something picturesque about it! And is well cover'd o'er with moss.'" No doubt some people took the idea of the "picturesque" more seriously than others - for many, it may just have been an excuse for a pleasant excursion in good company - but a great many itineraries were published, establishing domestic tourism in the British Isles and creating real commercial opportunities. The 18th Century Prince's Tower at La Hougue Bie, Jersey, which features in my novel, Omphalos, took on a new lease of life in Victorian times as a picturesque ruin. A hotel opened on the site, and, when my archaeological team excavated La Hougue Bie the 1990s, the volume of china, bottle-glass, chicken bones and oyster shells that we recovered, together with graffiti from the plaster of the tower, gave us a vivid sense of its popularity. 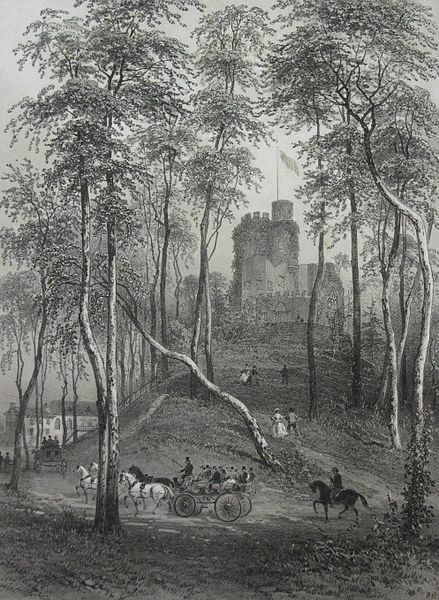 The Prince's Tower, by Felix Benoist. The hotel can be seen in the background. Photo: Man Vyi (image is in the Public Domain.